Some may call it coincidence, and others perhaps good fortune, but I call it whimsy in motion. Last week, two packages addressed to me, arrived on the same day. One made its journey from Tennessee while the other had traveled all the way from Australia... I was anticipating the latter as I knew I had won a sweet little papier mache crown from the magically talented Aussie artist, Victoria Sayer. While I was hosting my blog giveaway back in January, she popped in to invite me to enter hers at the Green and White Garden. 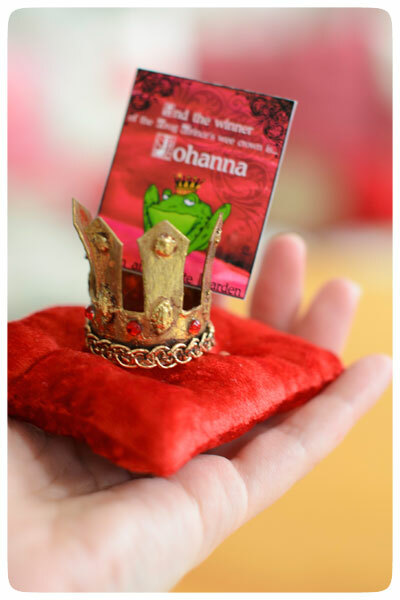 Weeks later, a happy message appeared in my in-box stating that I had won the frog prince's wee golden crown! Her charming grand daughter, dressed as a pirate captain, drew my name from a slew of fans! What fun I thought, and how lucky I must be! 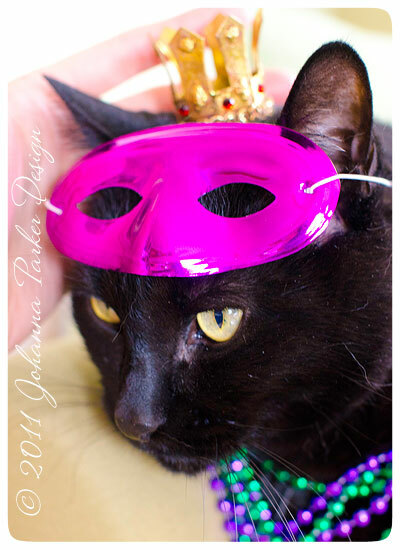 Then, a few weeks later while casually chatting with friends and family on Facebook, my (fairy) godmother Melinda reminded me of Mardi Gras and asked if Jack would be modeling for the Carnival. 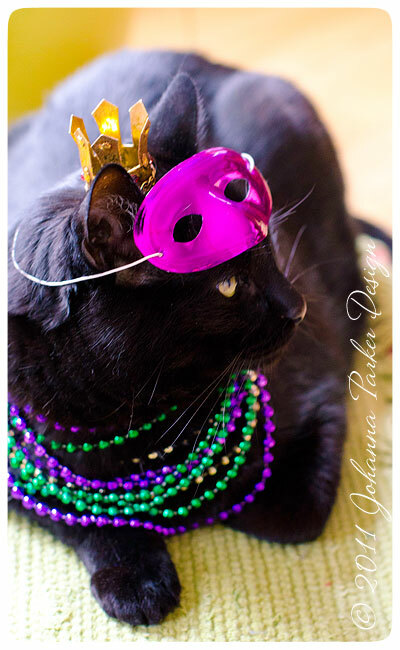 The thought had never crossed my mind, but we giggled a bit about the idea and went on our merry way.... To my surprise, the other package was from Melinda, and it contained a shiny loot of Mardi Gras beads, a festooned purple glove and three mini masks, just Jack's size! Was it a coincidence that Victoria's wee little crown was just his size too? 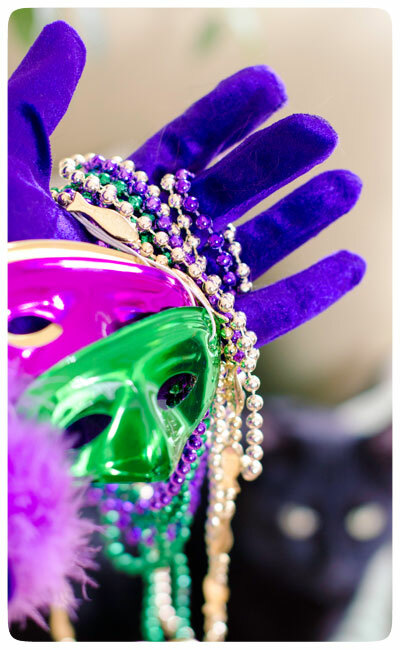 Then, images of Mardi Gras flashed in my mind ~ beads, masks, feathers AND crowns parading in a frenzy of color and delight! OK, I get the hint!!!! I laughed and laughed and had Jack model the bejeweled treasures this afternoon for additional grins! And, I guess it was meant to be! 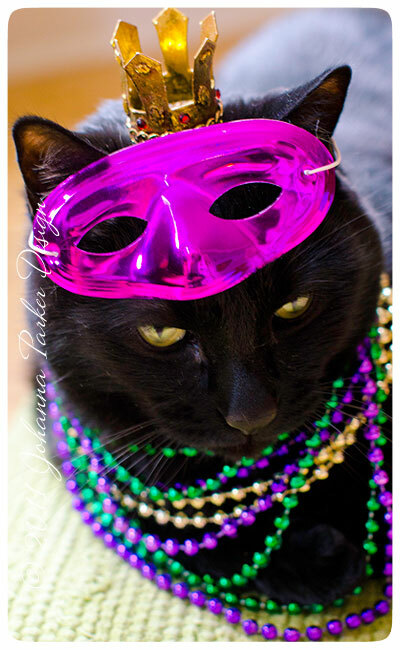 The whimsy in motion worked its creative magic, and the photos below bring it ALL together! 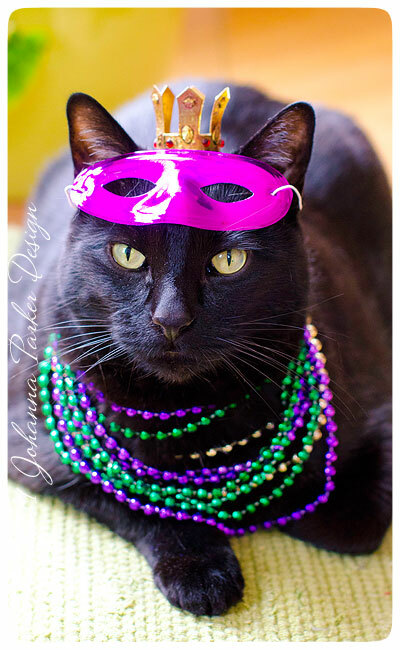 Jack, in his purple, green and golden finery, would like to wish you a jolly Mardi Gras and gives us all an excuse to smile, laugh and perhaps add a little extra bling to our wardrobes this spring!